My husband taught me early on in our marriage that most issues are not simple and I needed to be very careful to get ALL of the information before I opened my mouth. Even what seems very straight forward really isn't. Take gun control for example. Following one of our awful mass shootings this fall I was spouting off about how ridiculous and wrong it was to allow one person to own so many weapons. "There should be laws limiting gun ownership." I said with great authority. "How many is too many?" he asked. See, when something is written into law it...well it becomes a "law". Down in black and white and everyone is expected to obey it. No nuances or exception. We own many guns. Some inherited from great-grandparents. My husband and his family hunted to feed the family. We have those guns in our house. Then we have the gun my husband bought with his first earnings on the farm for pheasant hunting and another to hunt deer with. We have given one to a grandson that hunts deer. Yes indeed, we own quite a few guns. And the law would apply to us too. So, the question remains "How many is too many." We all know there are so many questions and not nearly enough answers. Illegal aliens come up in the conversation often here in Arizona. Doing the right thing while protecting children is a hard issue to address. A knee jerk reaction would tell you that we should deport the parents and keep the children they came across the border to birth. Oh my, think of the chaos that would create. How about the homeless veterans that line the highways and live under the cactus here. People will say that we need to take care of them first and then the Syrians last. But do any of those people want a homeless camp or drug treatment halfway house in their neighborhood? Do they want to take in the mentally ill or pay the extra taxes to care for them? And where oh where do we draw the line between what people can choose to do and what they can't? And last of all we might ask where are our latest group of refugees living in our country. Is the Syrian or a religious community welcoming them and helping provide for them? See, there is never an easy answer. 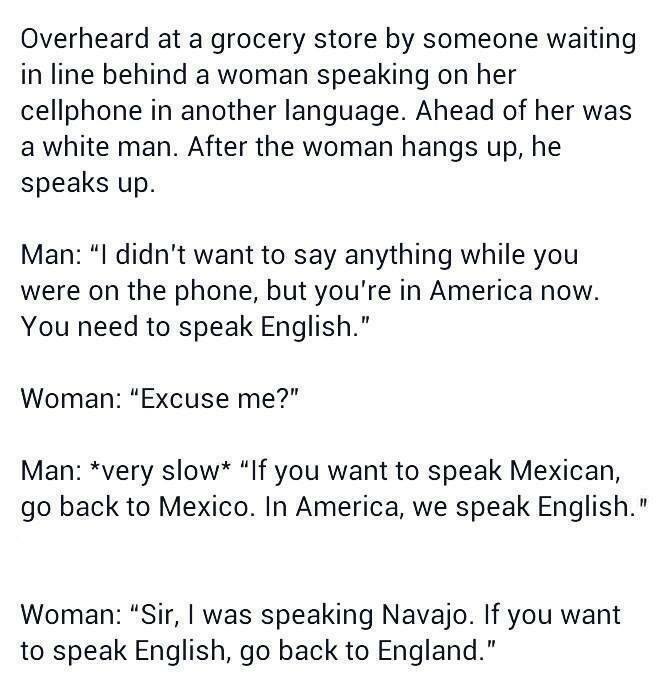 So, the next time we hear a strange language being spoken we need to remember that all of us save the Navajo people and others like them are descendants from someone that "spoke a foreign language" back in the day. We are very lucky they were not sent back to their home country. 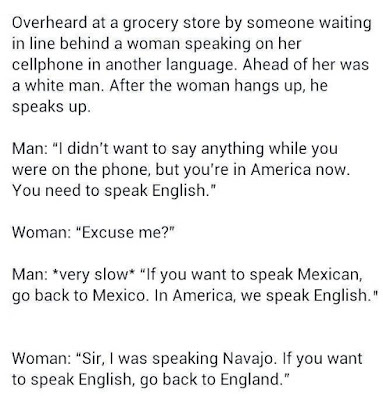 And speaking Spanish/French/German and English both is being bi-lingual. Actually, it an enviable skill and I wish I could do that. We need to remember what we as a country are all about. We are a melting pot that has always welcomed the downtrodden and, depending on where you live, the languages we hear on a daily basis are many. I like that. So there you have it. That is what I think. I might add that I do not think being an illegal is good and I wish that those people would realize that they need to get in line with those that are trying to enter our country legally. Honest, the law is the law! RJ, yes people like us do question everything. I think we are doing the right thing. We can never have too much good information. One thing we (hopefully, but not always) learn as we age is that there are no easy answers - oh, if only there were! The Navajo story reminded me of something that happened in 1973. I reconnected with someone I went to junior high school with at a summer job we both had at the Immigration and Naturalization office in downtown Manhattan. This girl was of Native American descent. When we had a new employee orientation and the teacher tried to break the ice with "what country did your ancestors emigrate from?" did he ever get an earful from her! But one sad fact is, our country has not always been the most welcoming to refugees - you may want to search for the story of the ship St. Louis, a dark chapter in the history of our country. I will do that. Thank you Alana. Yep, get all the information. How many guns, and who should be deported, and who should stay? Yet so many arguments are over what we cannot predict. We avoid politics and religion a lot! You're so right, most issues are more complicated than the bumper-sticker-type comments we see on facebook. But a far as guns are concerned, the best idea I've heard is that we should allow people to have as many guns as they want. But all guns would have to be registered and insured, just like cars, so they can be traced if they're stolen and owners held responsible if a gun causes damage. Good point Tom. We took all of the bolts or whatever off the guns and put that part in our safe. If someone steals them they will not be easy to fire. My son-in-law bought big safe for his guns. A solution? Who knows!